You start the command (OPEN, LAYER, BHATCH etc.) and nothing happens: LT acts like the command is running, but you have nothing on screen. You are able to cancel the command. Your pop-up may be off screen: start themmand, on the keyboard use the combination of ALT+SpaceBar+M then use the arrow keys on your keyboard to nudge it back to view (this is a Windows feaure, you can use it to recover any lost pop-up in LT or other programs). EXPLODE command allows you to convert complex objects to their constituent components. Explode Mtext to get Text. Explode Plines, Mlines, Hatches, Dimensions and Leaders into Lines, Arcs, Text, etc. Explode Blocks to their component parts. Exploding a Block sometimes gives us undesirable results. Often a Block is created from entities on Layer 0, so that it can be inserted on any Layer and thus inherit the properties of the insertion Layer. When exploding a Block of this type, all the components revert back to Layer 0. XPLODE command (notice the missing E) works similarly to EXPLODE except it gives you the opportunity to override component entity properties. You can control the target Layer, Line type, Line weight, and Color, or Inherit all properties from the Block insertion. You can also control what you explode individually, or globally (covers all entities being exploded). Highlight the desired cells you want to import into LT. Minimize MSExcel, do not close the program or you will lose the selected cells copied to the clipboard. Open LT and a new or current drawing. Choose Edit > Paste Special from the pull down menu. In the Paste Special dialogue box, choose "AutoCAD LT Entities". Choose an insertion point for the table. Remeber that the table size, text height ..etc, is based on the current Table Style. Open LT and a drawing containing a completed table. Select the table and right-click. In the right-click menu choose the Export option. Save the table in a folder. Notice that the table is saved as a .CSV file (Comma Delimited). In MSExcel, go to File-->Open in the pull down menu. In the Open dialogue box, change the "Files of Type" option at the bottom to "All Files". Navigate to the folder containing the .CSV file and select the file to open. Lynn Allen's free video Tips and Tricks online HERE. LT2008's new text/annotation features explored HERE. Creating attributes: labels, tags and editable text inside blocks HERE and in this MOVIE. And in case you need it, here is a Block OVERVIEW as well as WBLOCK command. Many more links found HERE. An overview of Palettes with Blocks HERE. Help with PLOT command provided at the great SITE. And more importantly, understanding UNITS and Scales settings inside AutoCAD HERE. CUI video tutorials HERE: originally developed for 2006, still very useful for an overview if you use later versions. Additional customization tips and ideas HERE. 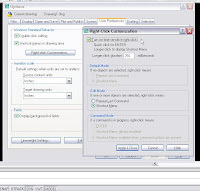 eTransmit command, the best way to send/email drawing files to others HERE. Using Groups in AutoCAD, tips and insight HERE. Creating a Dynamic Block in LT2007 and higher HERE: this example creates a door block HERE to see it all in action. Layers and Linetypes overviews HERE. Dealing with gaps, either in lines, plines or hatch areas, click HERE. Setting up text and dimensions, PART1 and PART2. More links on Dimensioning HERE and HERE for Text. Selection options other than W and C discussed HERE. Creating your own custom Plot Style Table (CTB) HERE. Creating your own custom simple linetype HERE. Creating and using Layer Filters HERE. Learn how to best use Grips with objects in AutoCAD HERE. Tables in AutoCAD are introduced HERE as well as this SITE. Paperspace/Layouts overview explained in TWO VIDEOS. Many more links HERE. Examine some good links on VIEWPORTS as well. OPTIONS command and it's many tabs and selections explained HERE. Understanding Xrefs and paths HERE. Using OTRACK, or Object Snap Tracking new to LT2007 and higher HERE. POLAR, or Polarmode use, and alternative to ORTHO on/off discussed HERE. Rotating views in your drawing discussed HERE. For LT2008 tutorials on CD, 100 video lessons in 10-hours for one low cost, review the option to purchase HERE. Free lessons here that comes from a great book LT2008 For Designers, click HERE. More LT lessons here: LT2005, LT2007 and LT2008. Plotting to PDF using any free or purchased (or built in driver in LT2007 and higher), or any other 3rd party driver to create a file is a convenience until the file name prompt stops echoing the DWG file name and presents the user with an empty box to fill. FULLPLOTPATH is a variable added in 2006 to help overcome AutoCAD/LT's ability to overwhelm drivers that can't handle receiving the full path of the file in the plot. SImply type it at the command line in LT, and when prompted set it to 0 (zero). 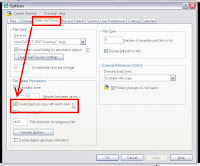 Your PDF driver should start placing your DWG file name in the box when prompting you for the PDF file's name. Selecting layers options including Select All layers (CTRL+A is another option), Clear all selected layers, Select ALL Layers except the current active layer, and Invert Selection (select all layers except the ones you have selected when you choose this option). Create a new Layer but Freeze it in all viewports in all layouts in the file you are in. Freeze a selected layer, or layers, in all viewports in all layouts in the file. Thaw a selected layer, or layers, in all viewports in all layouts in the file. Invert Layer Filters, as well quickly accessing layer filter default options. Set a Layer State (basically take a snapshot of all your current layers settings and save to recall later as needed). PLUS the rgular features of creating a new layer, deleting empty layers, renaming and more. More LAYER command features and abilities to follow in future blog entries. Stay tuned. Fail to Create CommCntrClientSink object! Starting LT presents this error message: you can click OK and get into LT but find thatProperties and other features do not function. The cause is usually after the use of a Windows Registry Cleaner that many websites tout as necessary. In most circumstances, using that Registry Cleaner's Undo or Restore feature fixes the problem, most quality products also include an exclusion option where you can add AutoCAD/LT to the list of programs not to touch. If you use a freebie or a bargain cleaner, they don't restore or recover well. A repair reinstall of LT fixes the problem as noted HERE. If not, you need to go a step further and completely uninstall all Autodesk products on your system as discussed HERE, then reinstalling them after a Windows restart. Click on this for a GOOGLE search on the topic and other solutions posted. BAK files are backup files created on manual Saves, they reside in the same folder as your DWG file and all you have to do to recover one is to rename the file extension (if you have that feature turned on in Windows Explorer) from BAK to DWG. Of course, you need to turn on BAK file creation first to get them: See screenshot below in OPTIONS command. Some I.T. personnel may not realize how important these files are so you need to push to have them if necessary for instant recovery as opposed to I.T. 's day-old recovery. You need to turn on the Autosave feature first to get them: See screenshot below in OPTIONS command. Rename the file extension (if you have that feature turned on in Windows Explorer) from SV$ to DWG. AC$ files are temporary AutoCAD working files for various functions (undo, hidden lines...), ac$ files do not contain drawing data, you can't use them for anything or recover any data from them for your use. You can import content from another DWG file into your current one, such as Linetypes, Layers, Text Styles, Dim Styles, Table Styles, Blocks, Xrefs and Layouts. Using the Open Drawings tab, you can access the above content from ALL the current files you have open at the time, so you don't have to go browsing for the files first. You can also use the History tab the same way, except to access files you recently opened in LT.
You can use ADCNAVIGATE command to go directly to a folder before you open ADCENTER: great customizing tip if you have many folders that you access regularly for content. You can drag and drop a DWG file into your current file to INSERT it as a block. If you drag that DWG file with the mouse's right-key, you get the option to start the full INSERT command pop-up, or attach that file as an XREF. You can set a folder to be the default go-to folder everytime you start Design Center: in the Folders tab, navigate to that folder, then right-click and select Set As Home. You can create a ToolPalette of all the dwg files from ADCENTER without doing it manually yourself: in the Folders tab, navigate to that folder, then right-click and select Create Toolpalette Of Blocks. You can drag and drop single Hatch Patterns from .pat files into your file, without using BHATCH command or placing them in any search path. Many 'old-school' AutoCAD users do one thing the first time they start a new AutoCAD version: kill right-clicking feature for the 'faster' option of having it set to simply function from the keyboard. You will miss half the features of LT by doing this unfortunately, and your imagined speed gain is lost. LT2004 and higher offer a compromise that is more productive than either option alone: A new time sensitive right-click. When this ability is turned on, a quick click of the right mouse button is the same as pressing on the keyboard. Holding down the right mouse button longer than the specified time yields a context sensitive menu (when appropriate). To set, start OPTIONS command, choose the User Preferences tab, turn on Shortcut Menus in Drawing Area selection, choose the Right-click Customization button: turn on Time Sensitive Right Click. Change the time interval as needed until you find the setting most comfortable with your hand and mouse. In the Plot dialog box, clear Hide Objects. If you need this setting for the rest of your drawing, you will need to change to SHX fonts in your text styles. Turn off the Hideplot property of the viewport. If you need this setting to achieve a desired plot ability, you will need to either change to SHX fonts in your text style or place the text in Paperspace out of the viewport. Turn off Shadeplot > Hidden Property of Viewport in LT2004, LT2005, and LT2006. LTSCALE is set and the linetypes in Modelspace appear as set: clicking over to Paperspace (Layout) shows no linetypes in the viewport. REGEN command does not solve the problem. The user must change the setting for the layout variable PSLTCALE (or better yet, copy a preset Layout from a template that is set correctly instead of randomly starting a layout from scratch). PSLTSCALE controls linetype scaling of objects displayed in paperspace viewports. 0 (or off) Linetype dash lengths are based on the viewport scale, they are NOT the same spacing. 1 (or on) If TILEMODE is set to 0, dash lengths are based on paper space drawing units, even for objects in model space. For any linetype, the dash lengths of a line in a viewport are the same as the dash lengths of a line in paper space. Set the appropriate units in the UNITS command: Angular units to Surveyor, choose the direction button, set Angle Direction to East, Rotation to counter clockwise. Start LINE or PLINE command and enter the points needed as relative polar coordinates. NOTE: no spaces needed between point entry text, shown here just for clarity. Many tips offered in this blog list the command or variable by name, not by menu location or toolbar button, and this confuses some readers that are more confortable hunting down such locations for convenience sake and ease of use. A Layout with many viewports only displays some, or worse, only one viewport content at a time, but clicking inside of of the others activates it but turns on a previously displayed one. Explore MAXACTVP variable in HELP, it controls how many active viewports you can see at anyone time. Limit is 64 though. You need to create a large ARRAY and notice that LT hits a limits and stops. You can change this limit by setting the MaxArray system registry variable using SETENV and entering a number between 100 and 10000000. MaxArray must be entered with the capitalization shown. You create, or try to, a very dense hatch pattern and LT objects that the hatch is too small or the dash length is too short: first make sure that SOLID hatch is not what you really need. If that's not the case, the hatch object limit is set by the MaxHatch environment setting: change this limit by setting the MaxHatch system registry variable using SETENV and entering a number between 100 and 10000000. MaxHatch must be entered with the capitalization shown. LT2002 could just not get rid of this problem once it showed up, and Autodesk never provided a permanent fix: some users had some luck turning off video card hardware acceleration but most of us never really found a fix. It was often, but not exclusively triggered by a Pan or Zoom function. LT2004 required the Service Patch to be installed to remove the symptom/cause noted above. If you have done this or are using a version of LT higher than 2004 and you still get this problem, so far it's been solely attributed to a conflict on your PC with another software package, and often requires that software package to be removed or updated. When creating a block, the selection order of the attributes is key to controlling the prompt order of the attributes when you INSERT the block. While in BLOCK command, select the attribute definitions individually in the order you want to be prompted, then select the rest of the geometry/entities that will be the block. Start INSERT command and test your block, make sure ATTREQ variable is turned on. 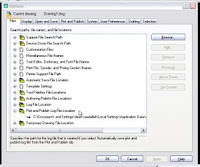 Similar to the EPS file creation tip below, LT has the ability to create many popular Raster File formats as well. These allow you to generate graphic content for other apps like MSWord or MSPowerpoint from your AutoCAD files. Choose File > Plotter Manager. Choose Next, then Next again (accepting My Computer). Under Manufacturers, choose 'Raster File Formats'. Under Models, choose the raster file format you need. Choose Next until the Finish button becomes available. Note that some additional options exist to set if you so desire, including the ability to control the raster file background color. Now start PLOT command, select the plotter you just create, and use any or all of PLOT command's options and features to create your custom raster file. Click HERE for Autodesk's topic "Understanding dpi resolution with the Raster File Formats HDI plotter driver". To align several drawing entities quickly (blocks or text, e.g. left-align texts to a border) just select all text objects to be aligned (justified), open the PROPERTIES palette and set a new common X-coordinate (Geometry: X-position) or Y-coordinate (Geometry: Y-position). WBLOCK command is a create tool for creating a new file from content in your current open drawing. Simply select the entity or entities, give the selection a new name, and a new file with that name is created at a location of your choice on your PC or network. Entering the name of an existing block writes that block to an external file. Note that this function is not available with an external reference (xref) or one of its dependent blocks. Entering an equal sign (=) specifies that the existing block and the output file have the same name. Note that if no block of that name exists in your open drawing file, the prompt is displayed again and you must select another block name. Entering an asterisk (*) writes the entire drawing to the new output file, except for unreferenced symbols. Model space objects are written to model space, and paper space objects are written to paper space. A great way to creat a new file but still maintain existing layouts. Note: After the file is created, the selected objects are deleted from the drawing. You can use OOPS to restore the objects. CTRL+click stopped working? To cycle through overlapping objects in all AutoCAD versions 2007 and higher, roll over the object on top, then hold SHIFT and press SPACEBAR repeatedly until your required item is selected. LT provide the ability to disable rearranging of toolbars and docakble windows like Properties and DesignCenter in any workspace. A lock icon in the status bar tray indicates whether toolbars and windows are locked. Right-click the icon to display locking options. Many seasoned AutoCAD users prefer to create blocks on layer 0 (zero), and set the block entities to Bylayer so as to have maximum flexibility possible in block placement and Properties controls. To repair such a setting in LT2008 or higher, redefine the block(s) with the SETBYLAYER command. Or worse, opening an MSOffice Application (Word, Excel, Outloook) starts Autocad/LT's installer. Have you ever needed a command to repeat, and repeat, and repeat, as you do something very repetitive over and over again? MULTIPLE command is what you need. It has a very simple function: it repeats whatever command you type right after it. For example, you need to use MOVE or FILLET or CHAMFER commands etc. on many objects individually. At the command line, type MULTIPLE then the command you want to repeat, then use as normal. Every thime you finish the command, it restarts. To cancel, simply tap the ESC key on your keyboard. Here is an ongoing list full AutoCAD users would consider missing from LT out of the box, encompasses many versions, not just current shipping products. Only AutoCAD MEP for an Object Enabler available (no Architecture/adt OE: supposedly fully built in but then why is there one for full autocad, no Mechanical/Civil/MAP OE, No Raster Design option, No Vault etc.). LT can create many types of file formats for use with other programs, much more than the very limited EXPORT command many casual users search for answers. These are provided in the form of plotter drivers that you create and use with PLOT command. If double-clicking inside a viewport causes the display inside to what is best described as Zoom>Extents, your file has a setting that needs to be changed inside each and every viewport in each and every layout in this one DWG file. First, lock your viewport (a great habit on it's own), then double-click inside it. At the command line type UCSFOLLOW, and set it to 0 (zero). You may now safely unlock your viewport, if you must. Don't forget to repeat in every other viewport in this file. LT provides a great tool for searching DWG files for content like BLOCKS, DIMSTYLES, DRAWINGS, HATCH PATTERNS, LAYERS, LAYOUTS, LINETYPES, TEXTSTYLES etc. Start Design Center (ADCENTER command or CTRL+2), click on the Search button, and use the new pop-up to select what you are looking for plus other search parameters to find your content quickly. ADCENTER command can also be used to identify where a drawing file is being Xrefed. AutoCAD 2008 include topics such as Introduction, DWF Underlays, DGN Support, Layer Properties, Set Object Properties ByLayer, Layer Notification, Layer Lock and Fade, Layouts and Sheets, Traditional Annotation Scaling, New Annotation Scaling, Dimensions, Multileaders, Text, and Tables. Read the following article HERE on what you can do to find out why your AutoCAD/LT seat is running slow. Under some circumstances, it is possible that a drawing file becomes defective. This can result from hardware problems or transmission errors. If a drawing file is corrupt, you might be able to recover it. If a drawing file is damaged, you can recover some or all of the data by using commands to find and correct errors. When an error occurs, diagnostic information is recorded in the aclt.err file, which you can use to report a problem. RECOVER command. Performs an audit on, and attempts to open, any drawing file. RECOVERALL command (LT2008 and higher). Similar to recover, it additionally operates on all nested xrefs. The results are displayed in the Drawing Recovery Log window. AUDIT command. Finds and corrects errors in the currently open drawing file. Backup files help ensure the safety of your drawing data. If a problem occurs, you can restore a drawing backup file. Computer hardware problems, power failures or surges, user mistakes, or software problems can cause errors in a drawing. By saving your work frequently, you can ensure a minimum of lost data if your system fails for any reason. If a problem occurs, you can restore a drawing backup file. In the Options dialog box, on the Open and Save tab, you can specify that backup files are created when you save drawings. If you do, each time you save a drawing, the previous version of your drawing is saved to a file with the same name and a .bak file extension. The backup file is located in the same folder as the drawing file. You can revert to your backup version by renaming the .bak file in Windows Explorer to a file with a .dwg extension. You may want to copy it to a different folder to avoid overwriting your original file. A hardware problem, power failure, or software problem can cause this program to terminate unexpectedly. If this happens, you can restore the drawing files that were open. If the program fails, you can save your current work to a different file. This file uses the format, DrawingFileName_recover.dwg, where DrawingFileName is the file name of your current drawing. After a program or system failure, the Drawing Recovery Manager opens the next time you start AutoCAD LT. Drawing Recovery Manager displays a list of all drawing files (DWG and DWT) that were open. Note: Unsaved drawings that are open at the time of an unexpected failure are not tracked by the Drawing Recovery Manager. Be sure to save your work after you begin, and regularly thereafter. Note: The drawing, backup, and recover files are listed in the order of their time stamps—the time when they were last saved. Doubleclick a top-level drawing node listed under Backup Files to display up to four files as listed above. Right-click any node under Backup Files to display shortcut menu options. If you close the Drawing Recovery window before resolving all affected drawings, you can open Drawing Recovery at a later time with the DRAWINGRECOVERY command. Each time you start AutoCAD/LT, the My Documents folder is the default path in each standard file selection dialog box. Alternatively, you can configure AutoCAD/LT to always default to a specified path by changing the default drawing folder using the REMEMBERFOLDERS system variable. DWG, DWT, and DWS files that are created with Autodesk applications and RealDWG™-based applications are trusted by Autodesk. When you open a TrustedDWG file, the following icon displays in the application status bar or the drawing status bar. The drawing file was not saved by an Autodesk application or RealDWG-based application. 1. Right-click on a toolbar and select Customize... to open the CUI Editor. 2. In the upper left area, expand Keyboard Shortcuts and then Shortcut Keys. 3. Drag a command from the command list below into the Shortcut Keys (I used the first command .XY). 4. The command should now be in the Shortcut Keys area. This creates a new shortcut key with the same name as the command. Right-click on the new shortcut key and select Rename. Rename it to "F1 Remap" (no quotes). 5. In the properties area for the new shortcut key, Change the description to something else (or just delete the text there). 7. In the Keys text area of the access heading, clickinside the text area to activate it and then press the button on the right with the three dots. 8. The shortcut keys dialogue box comes up. Place a cursor in the area called "Press new shortcut key:" and press the F1 Key on your keyboard. F1 should now appear in that box. Click on the Assign button. F1 should now appear in the Current Keys section. Click on OK.
9. Click on Apply in the CUI editor and then OK.
ALT+TAB Cycles through all of your open Programs in Windows. LAYUNISO Turns on all layers that were turned off by the last LAYISO command. 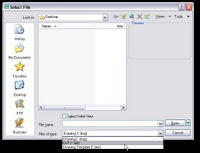 LAYVPMODE Controls whether the layer utilities LAYISO, LAYFRZ and LAYOFF use VPFreeze or the standard layer Freeze or Off when used in a floating paper space viewport. If you are currently limited to older versions of LT, your choices are limited to macros available at many locations including our Add-Ons for your older versions and freely posted menu macro code at Autodesk's LT discussion area. AutoCAD/LT does not correctly open a DWG file from a Windows Explorer by double-clicking, but displays the message: "Windows cannot find '*.dwg'. Make sure you typed the name correctly, and then try again. To search for a file, click the Start button, and then click Search..." . The problem seems to be the way AutoCAD/LT since version 2007 starts: instead of launching the program, file it goes through a 'launcher' instead. For several versions now, LT's COPY command has defaulted to creating multiple copies instead of the old-school single-copy mode. Many users find this difficult at first but many appreciate the ability soon enough: the command can be cancelled by not clicking but my hitting or spacebar on the keyboard. 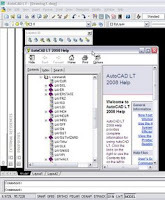 This is a new feature in all 2008 versions of AutoCAD, including LT2008. You can use the Autodesk technology preview tool ExportLayout to export a selected layout to a separate DWG file, all the entities creates as modelspace entities in the new file. Read about the limitations of this freebie add-on HERE. Sometime you need to SCALE an object, or worse, a whole drawing from some unknown scale to at least a correct known dimension for one of it's sides or sections. You could use DIST command to measure a known length, then do the math on a calculator and use SCALE command to get close enough to what it really needs to be. Or you can just let SCALE command do it for you: the following tip is a feature of ALIGN command found in full AutoCAD but missing in LT.
First identify a length you know needs to be somethng else: this could be a rectangle's side or a door or a bolt. Start SCALE command, Select the entity or portion of the drawing, or the entire drawing if that's the case, that you want to scale. When prompted for the Base Point, Select a point on the object(s) selected above. Instead of typing a scale factor, Type R (Reference) and select both ends of the dimension you want to correct (having running osnaps is best). Type in the new length that you want, or if you are simply trying to match a dimension on screen, Type P (Points) and click on either end of the destination dimension you are trying to match. Your entity(s) will now scale. ROTATE command also has a Reference feature that works the same way, a great tool when you need to rotate an entity or entities to align with another angled object easily. Explore the topic in LT's Help. Extra tip with both the above commands: check out the COPY option inside each, the action is applied to a copy but leaves the original intact. Pefer a book over a dozen blogs for tips? Other AutoCAD/LT 2008 books can be useful as well, click HERE. Here ia a tip that will make you popular with you billing folks, plot tracking: LT offers a free and simple way to track each plot you do, whether an image (pdf, dwf etc.) or to your printer, or plotter. And every AutoCAD/LT seat can write to the same simgle file too. Go to the Plot and Publish tab in OPTIONS command. Click Automatically save plot and publish log, and select the Save one continuous plot log button. After enabling the feature, go to the Files tab in OPTIONS command, and find Plot and Publish Log Location: change the path to a shared directory all your AutoCAD/LT seats can access, then Click OK.
AutoCAD will create a CSV (comma separated) file in that location. Each time someone sends a new plot it will be appended with the information about that plot. Open the CSV file with MSExcel or similar program to sort the file and generate a billing report for all your plotting. When you start OPEN command, a pop-up appears that shows you the current folder and highlights the current file you have open along with the list of other files and folders. If you've lost that ability to display the highlight of the current file, it's because you've changed (or never set) Windows Explorer properly in Windows. 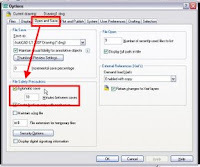 In Windows Explorer, Click on Tools pulldown menu, Select Folder Options, Click on the View tab, Scroll down the list and uncheck the box labeled Hide Extensions for known file types. You start OPEN command, and all you get is the command line asking you to type the full length address location and file name. To fix, change the setting of FILEDIA variable, explained in HELP in LT.
You start OPEN command and nothing happens: LT acts like the command is running, but you have nothing on screen. You are able to cancel the command. Your pop-up may be off screen: start OPEN command, on the keyboard use the combination of ALT+SHIFT+M then use the arrow keys on your keyboard to nudge it back to view (this is a Windows feature, you can use it to recover any lost pop-up in LT or other programs). You can also change the resolution of your monitor to lower settings, the layer manager will show up, move it to be centered, then change resolution back. If neither works, a reinstall of LT usually fixes it too. You can use the OPEN command's pop-up window to do regular Windows Explorer type functions, like renaming files, moving and deleting files, creating new folders, renaming folders and more. You can run AutoCAD/LT on an Apple PC/MAC, you just need to buy more software and your Apple device must be on the higher end with 2Gig Ram to function at a reasonable pace (no blue-light special unless you are a very casual user). There are two methods, one is to run Windows/AutoCAD in a "virtual window" on a Mac, ideal because you have access to and are in your Apple Operating System and applications at the same time, or you can reboot and run only Windows/AutoCAD on your apple hardware (what's the point of that I'm not sure).